Patient-centered outcomes research (PCOR) represents a fundamental shift in how research is prioritized and conducted. This educational seminar will increase proficiency in PCOR for researchers, clinicians, and policy-makers. Ongoing PCOR projects will frame discussions emphasizing key methods that differentiate PCOR from other research. Faculty includes an international group of PCOR experts and speakers including patient representatives and funders. Participants will learn optimal approaches and methodological challenges associated with PCOR and implications for care delivery. There is a growing recognition of the importance to better incorporate the patient’s perspective into clinical decision making. These are more reflective of patient preferences and values and include an evaluation of the outcomes that matter most to patients in their lived experience of health and disease. Patient-centered outcomes research (PCOR) represents a fundamental shift in how healthcare research questions are identified and prioritized, and research is designed, implemented and disseminated. PCOR is increasingly viewed as an essential component of developing sustainable, high quality and efficient care, and interest in and support for PCOR has increased substantially. However, because PCOR designs and methods are evolving, there is little information available to guide health researchers and providers in this type of research. Unique challenges exist in engaging patients, clinicians, researchers, policy-makers, and other stakeholders throughout the research process and in applying state-of-the-science PCOR methods. Content of this course has been specifically developed to include practical guidance from leading PCOR researchers at Johns Hopkins and internationally, patients and patient advocacy organizations and national sponsors of PCOR. Targeted didactic presentations focusing on key themes will be interspersed with panel and audience discussion time to ensure participants have adequate opportunity to interact with presenting faculty. Clinical and comparative effectiveness researchers, clinicians, medical educators, healthcare system administrators and policy makers with interests in identifying patient-centered research gaps and priorities, conducting PCOR, implementing and evaluating programs, and setting policy. 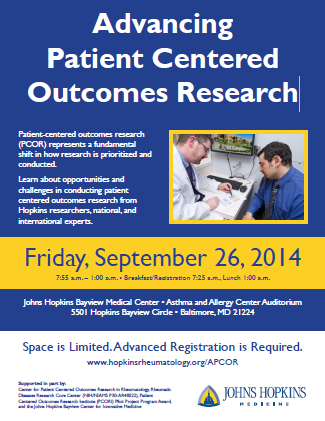 Describe core characteristics of patient centered outcome research (PCOR). Discuss strategies to successfully engage patients, caregivers, and other relevant stakeholders from inception of questions through dissemination of results. Identify rigorous methods to evaluate impact of PCOR on patient care, healthcare services and medical training. The Johns Hopkins University School of Medicine/Advancing Patient Centered Outcomes Research may include presentations on drugs or devices, or use of drugs or devices, that have not been approved by the Food and Drug Administration (FDA) or have been approved by the FDA for specific uses only. The FDA has stated that it is the responsibility of the physician to determine the FDA clearance status of each drug or device he or she wishes to use in clinical practice. The Johns Hopkins University School of Medicine fully complies with the legal requirements of the ADA and the rules and regulations thereof.